6/16/2008Share this story on Facebook! 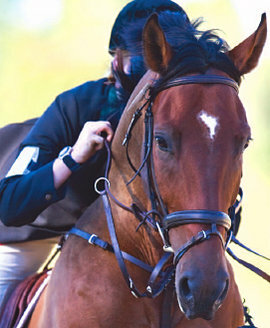 Competitions are judged by how well the competitors ride (otherwise known as equitation). Each show is divided into two portions: “over fences,” which requires each rider to navigate a course of eight jumps, and “flat,” in which multiple riders go into a ring without obstacles. In the flat, riders and their horses demonstrate the walk, the trot, and the canter. The beginners’ division demonstrates just the walk and the trot. There are seven riding level divisions based on experience, and each division has riders who compete for points. The place in which a rider places within his or her class determines the number of points awarded, which ranges from one point for sixth place to seven points for first place. Riding is an expensive sport. Members must pay for required group lessons as well as private lessons if they choose to take them. Riders must also pay IHSA dues and provide their own riding attire, meals, and gas money for each show, but the College covers the cost of showing. “Riding is a sport that most people associate with wealth,” says Avery. “We are in no way wealthy, so we do what we can to help each other.” To subsidize the expenses for each rider, the team hosts multiple fundraisers each semester. In fact, Ellison’s favorite memory isn’t of competition or riding lessons. It’s the time her teammates brought her a 50-gallon garbage bag full of romance novels. “I’m a huge romance novel fan, and instead of picking on me and making me feel embarrassed, everyone got really excited.” Almost every member of the team has now read Bold Conquest, a staple at every horse show. The highlight of the team’s fall show season is their annual trip to the Syracuse Invitational, where some of the best riders go to compete. “There are so many opportunities to learn, plus the opportunity to meet some of the world’s top competitors!” says Ellison. Avery says she always has a good time when the team is together, and she met Ellison, her best friend, through the team. “I hope to keep riding for the rest of my life, even if it’s not competitively,” she says. It’s easy to see that it isn’t just about the ribbons for Avery and every other member of the team. It’s about the horses, it’s about the people, and most important, it’s about memories made with good friends. This is a definite plus ! !